The speed of reduction and number of sessions required to reduce your tattoo will depend upon a variety of factors such as how old the tattoo is, what colour it is, how deep it is within the skin, how skilled the tattoo artist was, what pigment was used, how healthy you are, where the tattoo is located on the body, how tanned you are, etc. We cannot guarantee full removal of a tattoo. It is better to expect the laser to lighten the tattoo to a point where it is less noticeable. Most of our clients opt to reduce the tattoo to a point where it can be covered with a new, nicer tattoo. It is important to understand that the results from this treatment vary considerably and a small percentage of people will not respond satisfactorily to treatment. Multiple treatments are necessary and there is no guarantee of permanent results – maintenance visits may be necessary. It is very important to avoid sun exposure on the treated area for the duration of the treatment and for up to 1 month following treatment, and you must use a high sun protection factor to avoid sun damage. Tanned skin cannot be treated. There may be short term side effects such as reddening, bruising, swelling, mild burning or blistering, hypo-pigmentation, hyper-pigmentation, as well as rarer side effects such as scarring and permanent discoloration. It is also important to understand that the original tattoo may have caused scarring that may become apparent as the tattoo pigment is reduced. Laser tattoo reduction works best on a black tattoo, done well by a skilled artist, on pale skin. Naturally, most tattoos that people want reducing, haven’t been done by a skilled artist or put in at an ideal depth within the skin! Thus we will be able to give you a better idea of how many more treatments you may need after the first couple of sessions. Test patches are carried out to determine the treatment parameters (the best laser settings for your specific tattoo) and to judge how your skin might react to a full treatment session. 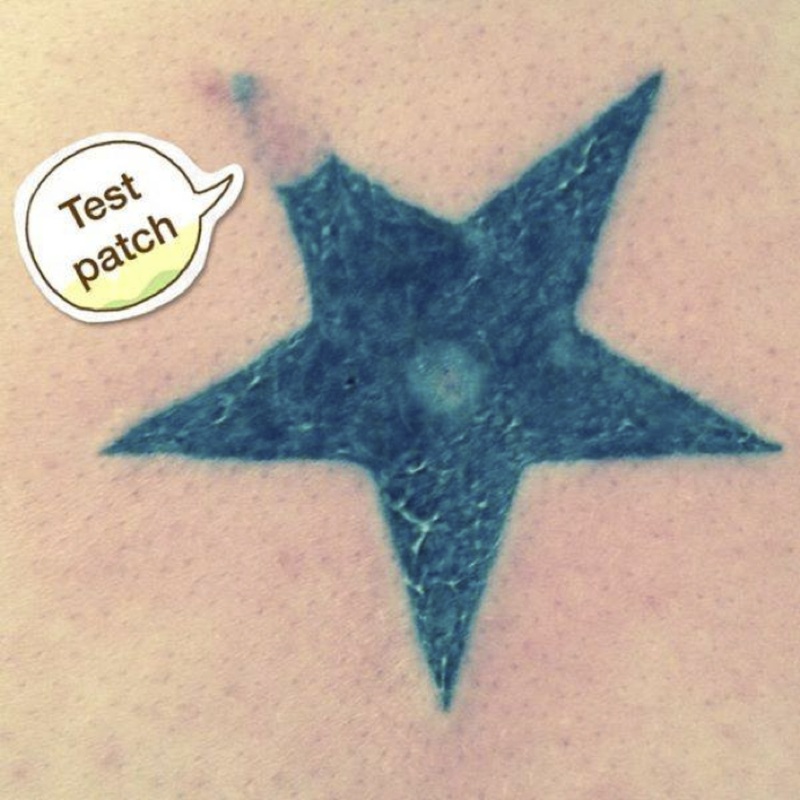 A test patch is a small trial area in a location within the tattoo that allows the practitioner to assess how well the light energy is being absorbed and whether the skin is responding as would be expected. Clients are asked to make a note of any redness or swelling and how long it takes to reduce following the test patch, also whether or not the skin blisters or feels excessively hot and for how long following the test patch. Discomfort: some mild to moderate discomfort is felt during treatment. The sensation is similar to snapping an elastic band against the skin and some areas are more sensitive than others. The area may appear to be bruised with a grey or purple colour following treatment. This usually fades within the following 5-7 days. Blisters / scabs / crusting: these are relatively common following tattoo removal treatment. This usually takes 7-14 days to heal – do not pick these as you could encourage scarring. Hyper/Hypo pigmentation: skin can develop temporary lightening or darkening after laser treatment. Pigment changes can be worsened with sun exposure. Hypo pigmentation usually occurs after multiple treatments. Pigmentary changes usually last 2-6 months but in rare cases can be permanent. Swelling: swelling following treatment is common, but will subside in 2-5 days and can be reduced with regular ice application or cold compresses. Infection: expect the area to secrete clear/white/pale yellow fluid throughout the healing process. Many people mistake this fluid as a sign of infection – please don’t worry. A green smelly fluid indicates infection. Sometimes, despite good wound care, you may find the site becomes infected as most tattoos are in areas that people touch or expose to pathogens which cause infection. Topical or oral antibiotics may be necessary. Scarring: the laser itself does not cause scarring, and in fact often reduces red or enlarged scarring. However as the laser reduces tattoo pigment, the old tattoo scar may become obvious. Also, if you find the site blisters, if these are knocked it can cause scarring. A scar may form any time the skin is disrupted but is rare following laser treatment. Good post-treatment care such as not picking and watching for early signs of infection will reduce the likelihood of this occurring. Persistent tattoo: complete clearance of the tattoo or lesion is not always possible. Careful evaluation and test patching before treatment may reduce the occurrence of tattoos worsening from laser treatment. Allergic reaction: on occasion, when tattoo ink antigens are released into the circulation, localized or systemic allergic reactions can occur. These possibilities can be reduced by going through the questionnaire with your practitioner. There should be no active or fake tan in the area to be treated. Use of sun beds or prolongued exposure to sunlight is not allowed for one month prior to treatment and an SPF 30+ must be used on the area between treatments. Suntans must be left to fade completely before treatment can start. Fake tans must also be fully faded before treatment can commence. In order to minimise skin heating and to reduce the likelihood of skin reactions, the treatment area may be cooled before, during, and/or after the procedure as required. If the area still feels hot at home, you can apply a cold flannel or a cool pack though be careful not to apply ice directly to the skin. Following treatment the area may appear red and raised and you may experience a tingling sensation. This is completely normal and should settle over the next few days. Occasionally you may experience swelling or bruising and this can last from 1-2 days up to 1-2 weeks. If you experience swelling, apply cool packs and take anti inflammatory tablets such as ibuprofen or arnica and anti histamines – please consult with your doctor prior to taking any medications. Make-up, creams and lotions (aside from sunblock) should be avoided throughout the healing process. Care should be taken to avoid any trauma to the area for the first week following treatment. Avoid strenuous activities, sauna and steam rooms, excessively hot baths, swimming, massaging the skin etc.